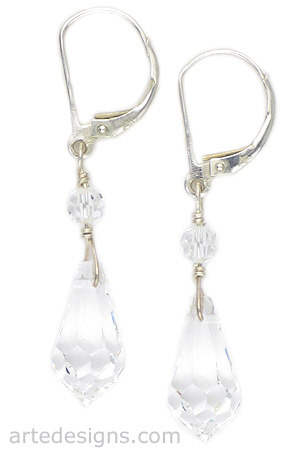 Classic, simple, and sparkly best describe these Swarovski Austrian crystal earrings. Perfect for brides or whenever you want to add some sparkle to your outfit. Approximately 1 5/8 inches long. Sterling silver leverback wires. Arte Designs pearl and crystal earrings are unique and handmade. This collection includes all different styles to fit any occasion. Pearl is an emblem of purity. It symbolizes love and happiness. Pearl is the birthstone for June. It is also the gift for the 3rd and 30th Anniversary.